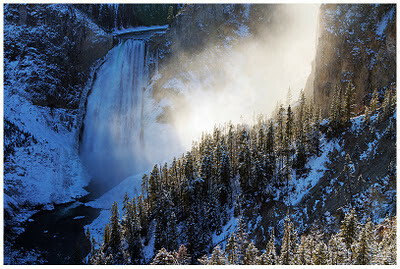 On the same evening I witnessed the glory of Upper Falls, I also visited the older, much larger, relative, Lower Falls. The water of Lower Falls has a massive decent of over 300 feet! The spray coming up off of the falls floor was astounding. The sunlight was coming in at a very flattering angle, lighting up only the area right of the falls. Making it easy to clearly see Lower Falls as well as adding an element of drama to the scene. The flesh snow covering the ground and all of the evergreen trees added a lot to the mood of the scene and compliments the hue of the water spilling over the cliff face. I hope you enjoy this unique take on the falls, I would truly enjoy any type of comment, negative or positive. Technical details: Canon 7D, Canon 24-105L lens (@47mm), ISO 100, F/8, Three shot HDR, middle exposure at 1/100.